The new EARTH T-Rex is available in 27.5″ and 29″ wheel size. It’s a high performance hub driven mountain bike that has a huge 48V lithium ion battery for extended range and high power demand. 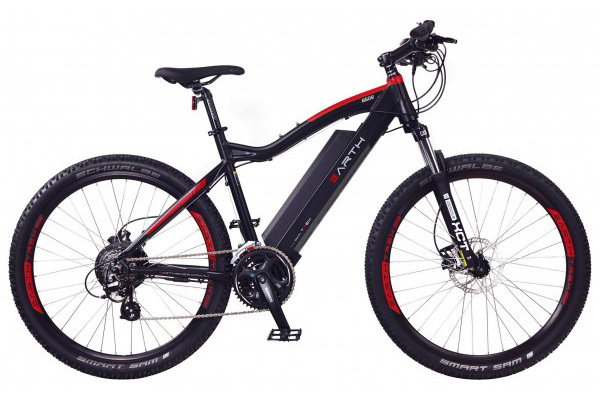 This is one of our most popular electric mountain bikes we sell due to a combination of price, quality components and handling. It can also be programmed through the LCD display for increased speed and open throttle control for those wishing to do a bit of off-road riding; keep in mind that 250W is the legal limit for riding on the road. This is one of our most highly recommended ebikes. Please come in and take it for a test ride!